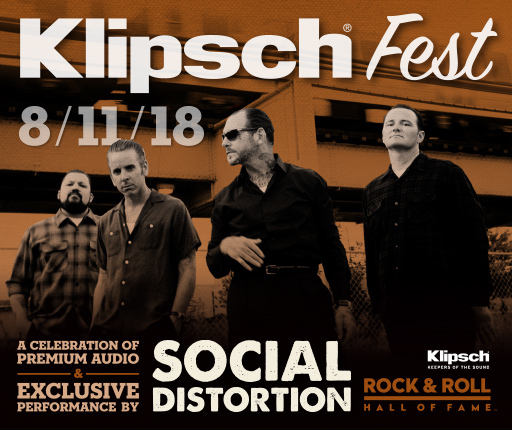 INDIANAPOLIS, IND (June 20, 2018) Klipsch®, a tech-driven audio company, is pleased to announce Klipsch Fest, a day-long celebration of its premium sound at the Rock & Roll Hall of Fame on Saturday, August 11 from 3 p.m. to 11 p.m. ET. Punk rock legends Social Distortion will headline the Rock Hall Live! event, which includes live performances, DJ sets, demos and giveaways on the PNC Rock Hall Live! stage. Social Distortion will take the stage at 9 p.m. ET. Klipsch Fest is free with the purchase of a general admission ticket to the Rock Hall and is on sale now at ticketing.rockhall.com. A VIP ticket, priced at $75, includes access to an exclusive Mike Ness “Under The Influences” event on Saturday, August 11 at 3 PM. Social Distortion front man Mike Ness will discuss his career as a songwriter and musician, share stories behind some of the biggest Social Distortion songs ever written and chat about the influential vinyl releases that influenced him as an artist. VIP tickets also include Museum admission and access to premium viewing and a private cash bar during the concert. Social Distortion formed in the late 1970s and broke in 1983 with the thrashing plate of punk and displeasure “Mommy’s Little Monster.” Their 1988 follow-up, “Prison Bound,” hinted at a sonic change to come, and by the band’s self-titled 1990 record and 1992’s “Somewhere Between Heaven and Hell,” their sound had solidified into the instantly recognizable brand of rock n’ roll that’s defined them since. Influencing bands such as Pearl Jam, Green Day, Rancid and so many others, Social Distortion’s appeal continues to cross all age brackets. Almost four decades later and they’ve managed to stay strong on their own terms, own time and by their own rules. Klipsch partners with the Rock Hall to preserve and celebrate the live music experience. Klipsch is the presenting sponsor of the Rock & Roll Hall of Fame Induction Ceremony. The Museum in Cleveland features the world’s largest installation of Klipsch professional and commercial loudspeakers and headphones. New exhibits such as the Power of Rock Experience, a redesigned outdoor plaza, and an interactive outdoor sound experience boast Klipsch speakers. The Klipsch Audio Stage, inside the Rock Hall, continues to host some of the most buzzed about bands in the world in addition to hundreds of performances each year. Klipsch Fest heats up Rock Hall Live! powered by PNC, which includes more live concerts, festivals and events than ever. Get the scoop on 2018 Rock Hall Live! events at rockhall.com.